If you are a Baalat Teshuva, briefly explain how you become religious. I was living in Manhattan, involved in a 4 year relationship with a non-Jewish guy, when I heard that a “cool” Rabbi was looking for someone to organize celebrity-hosted fundraising events and missions to Israel, and that I should meet him. I accepted the job shortly after I left my job at a big corporation and broke up with the non-Jewish guy– on the condition that the rabbi not try to make me religious. The rabbi respected the agreement, but I was exposed to hundreds of other kiruv professionals who wanted to get the cigarette-smoking, mini-skirt wearing party girl with the attitude to actually believe there was a God who ran this world and that I was meant to live according to his Torah. In addition, I was regularly going to Israel for my job. Between the two, very slowly, and without me being conciously aware enough to stop it, something was happening. Despite myself… Hashem made it all too clear. Lots of hashgacha, lots of the rabbi being patient with my questions and attitude, and lots of inspiration. I came to the terrifying realization that there really is a God… and He did give us the Torah. Along with that terrifying realization came the clarity that I had to embark upon a journey to learn what that really meant. Although scary, I was filled with the comfort of knowing that I had somebody very BIG to lean on. In 1999, my boss arranged for me to open an office for him in the Old City, and in addition to working, I began full-time learning. That was 15 years ago. How did you meet your husband? He moved in next door. My husband, Uri (Jason), is 7 years younger than me. He came to learn in the Old City and moved in next door after I had been living in the Old City and been Shomer Shabbos for 2 years. A friend introduced us and I would run into him regularly. I was dating pretty frum guys, he was Shomer Shabbos but still “hanging out.” Needless to say it was not so shayach. Because of that, it was “safe” for me to talk to him and we became friends. We didn’t “hang out,” but I did go to him for help sometimes and we talked when we saw each other on the street. I would make jokes about my nightmare dating stories and he in turn would go to his Rabbi to try to find me a guy. Anyway, on Purim 2002 after knowing him for 1½ years, Jason was released from his army reserve duty for the day. 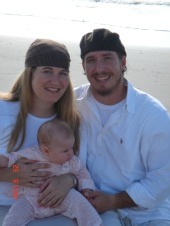 When I saw him that day, it was as if Hashem removed the blindfold from my eyes. It was so strange to me that I had never thought about going out with him before. That day I was stressed out about something, and he acted with so much compassion that he completely won me over. It took him a little time, but after a few months of not seeing each other, he too realized how he was feeling. He asked me out. We were engaged after 2 weeks of dating… that was 8 years ago. What’s your favorite part of being a mom? That is a tough question, there is so much…..probably the hugs and kisses, their cuteness and their innocence, watching them grow… loving them like crazy. What’s the toughest part, for you, of being a mom? Not knowing the right/best way to handle each situation, worrying about them, letting go, needing endless amounts of patience and not having it, sleep depravation, making time for me and not being the perfect mom. What’s the best advice for moms you’ve ever received? Really listen to what they have to say and give them lots of love!! How did you hear about JewishMOM.com? A friend told me about Jenny, and that she has a fabulous website! How long have you been reading JewishMOM.com? For about a year. What’s your favorite part of JewishMOM.com? Finding comfort in being able to identify with other mothers’ struggles. She’s amazing! I love reading these pieces, I’m always sooooo inspired. Best quote: “I’m still becoming religious.” Hits the nail on the head for me. I’m still making choices every year about how I want to do things, which chumrot are right for our family, etc. the kids are so adorable!! 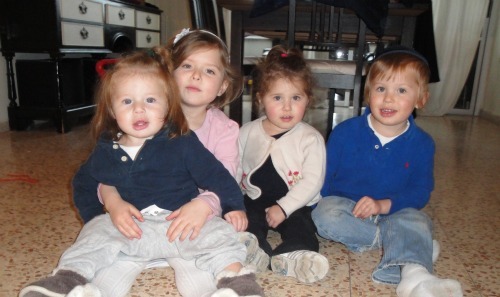 really cute kids-knayin hara- and i totally relate to the toughest part of being a jewish mom- kol hakavod- how true! ahhh the kids are so cute k”h!! This is so sweet! Thanks for sharing your story! And I get to be one of her closest friends!! Love you Weezy!! So proud of you and your family. You are a wonderful Mom, wife and daughter!